Even Martin Scorsese’s missteps are spectacular. Like Stanley Kubrick and Roman Polanski before him, the 67-year-old Scorsese tries his hand at redefining the horror-thriller genre with Shutter Island. For everyone who will regale in Scorsese’s ageless craftsmanship, others will recoil from a story that trawls mental illness, domestic violence and the Holocaust for cheap thrills and chills. Adapted from a novel by Mystic River scribe Dennis Lehane, Shutter Island is awash in the very nihilism it meekly assails, erecting thematic and historical straw men to buttress Scorsese’s provocative visual flourishes. Leonardo DiCaprio, now firmly ensconced as the muse of Scorsese’s later career, stars as Teddy Daniels, a U.S. marshal sent with his partner Chuck (Mark Ruffalo) to the titular (and fictitious) island in Boston Harbor. The year is 1954 and their mission is to track down an escapee from Ashecliffe Asylum, a hospital for the criminally insane. After a hurricane maroons Daniels on the island, he begins to suffer a torrent of nightmares, headaches and hallucinations that are associated with own demons, including the memories of the murder of his wife, Dolores (Michelle Williams), and atrocities he committed as a World War II Army grunt during the liberation of Dachau. In revealing Daniel’s true motives behind accepting his assignment to Ashecliffe, Scorsese fashions Daniels’ torment into a caldron of 1950s paranoia and mankind’s capacity for violence. In keeping with the Eisenhowerian milieu, there is lots of chatter about atolls, A-bombs, North Korean brainwashing and even the House Un-American Activities Committee. How all these seemingly disparate plot points are shoehorned together is half the fun—or folly—of Shutter Island. Suffice it to say there is a corker of a plot twist that, while outlandish, manages to tie up most of the loose ends. Although DiCaprio gives his white-hot beleaguered best and an accent as thick as chowdah’, the film proves a divisive affair: sometimes brilliant, sometimes maddening. While DiCaprio has his pick of roles (and his willingness to parlay his career capital on fare like this and Revolutionary Road is admirable), here the 35-year-old actor still looks a bit young to effectively convey a world-weary war veteran and widower. Ruffalo adds little, but the other supporting cast includes meaty performances from Ben Kingsley and Max von Sydow, as well as memorable single-scene monologues from Patricia Clarkson, Jackie Earle Haley and Ted Levine. Like the opening shot of a seasick Teddy, Scorsese regurgitates a bevy of cinematic influences, the most obvious being Sam Fuller’s 1963 film Shock Corridor, about a journalist who commits himself to a mental institution to solve a murder. Scorsese admits being inspired by the 1940s noir thrillers of Jacques Tourneur and Orson Welles’ adaptation of Kafka’s The Trial. Even casual moviegoers will see reflections of Kubrick’s The Shining and enough Hitchcock borrowings to shame even Brian De Palma: There are conspicuous allusions to Psycho, Spellbound, North by Northwest and Vertigo (a spiral staircase ascent to a tower’s overlook figures in the film’s climax). 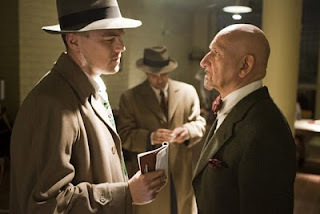 In other words, for all its CGI genuflecting, Shutter Island is an old-fashioned potboiler that, despite its faults and self-importance, is unrelenting in its audacity and visual stimulation. In the end, your opinion of Scorsese’s oeuvre will likely dictate your opinion of this film. His devotees will be delighted: Count me in.